Upper Big Wood River Grange #192 is the official name of the Hailey Grange, which was formed in 1924. 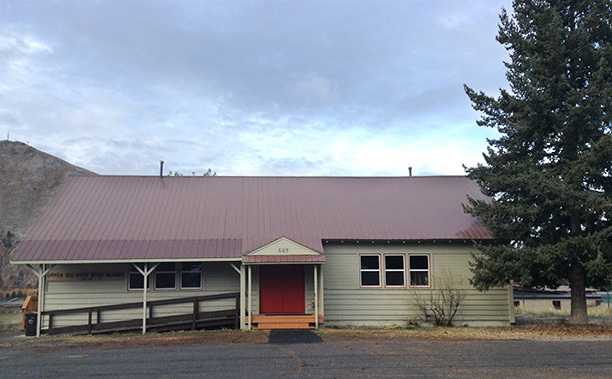 Our Grange Hall is located at 609 South 3rd Avenue in Hailey, Idaho. It is a historical building including a large room of approximately 40 x 30 feet, a kitchen, stage, upright piano, wood floor, and one wall covered in mirrors. A nice hall for community functions. The usual quarterly meeting night of the Hailey Grange Association is the third Thursday of the month. The Upper Big Wood River Grange is expanding its role in our community. The Grange movement is about “American Values & Hometown Roots”, therefore opening doors in community service, personal growth, companionship, and sharing community progress. New members are welcome. We currently sponsor and assist with the following social and civic organizations in the Wood River Valley. We are a chartered member of the Boy Scouting programs. We serve 4H/FAA programs, Sawtooth Rangers, Footlight Dance Centre, the Wood River Seed Library, The Trailing of the Sheep Festival, and give yearly scholarships for Blaine County High School graduates. The Hailey Grange is part of the Idaho State Grange Association, which in turn is part of the National Grange. The National Grange was founded after the Civil War in 1867, and is the oldest American agricultural advocacy group with a national scope. The Grange is a nonprofit, nonpartisan, fraternal organization that advocates for rural America and agriculture. With strong history in grass root activism, family values and community service, The Grange is part of more than 2,100 hometowns across the US.